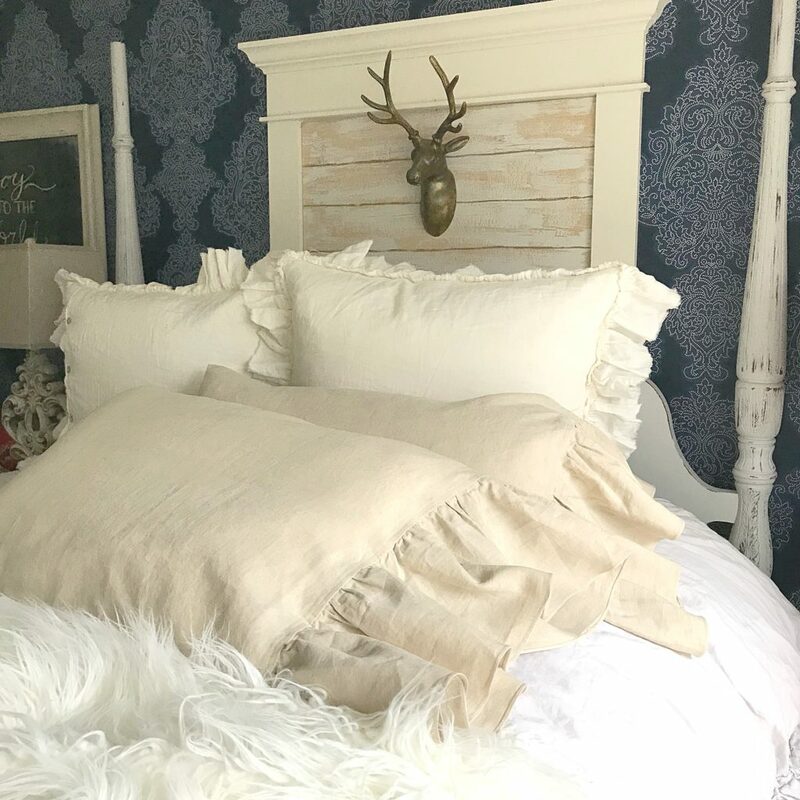 Are you ready for a Neutral Winter Decor Blog Hop? Neutral homes are nothing close to boring! They can help you feel calm and relaxed. Creating a neutral home can be so much fun, mixing different materials and patterns! I added a shabby chic twist to mine. 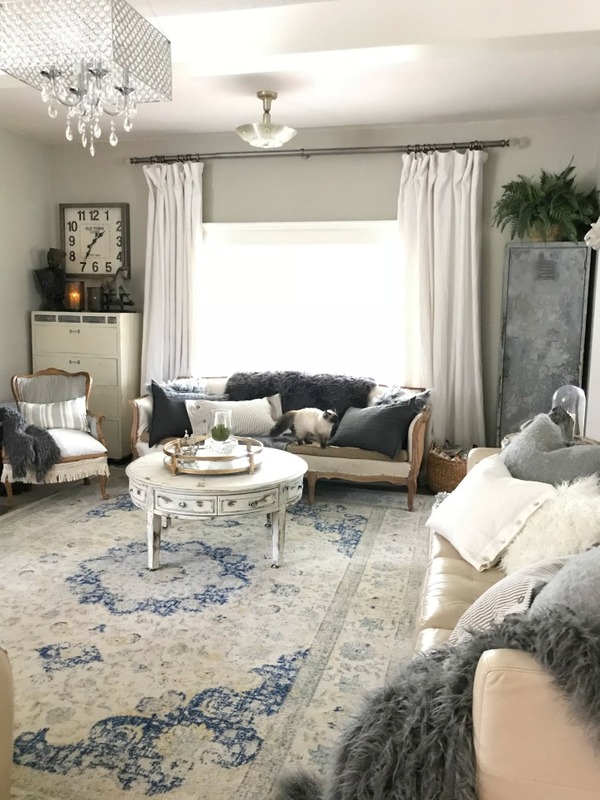 So come take a look at My Neutral Shabby Chic Farmhouse as well as some amazing blog friends who are linked below so you can tour their homes as well. This is a hand crafted mirror. It is my most favorite mirror in the house, it’s absolutely stunning. You can find it in my shop. 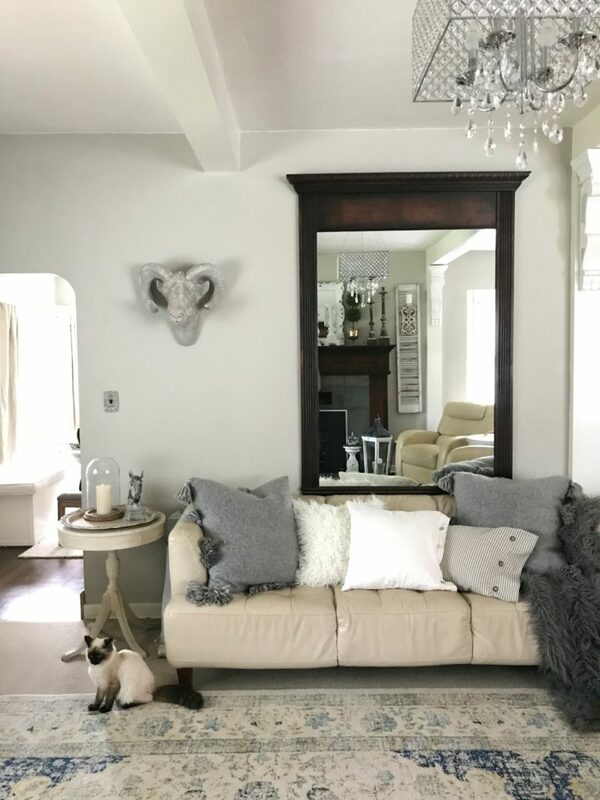 My farmhouse living room is one of the best places in the house! For my living room I have many different shades of all soft neutral colors. I throw in a couple patterned ones, blue is included in the color palette but it is soft enough to still be neutral. I love to change up my house quite often, so you will always find a new look in my home. 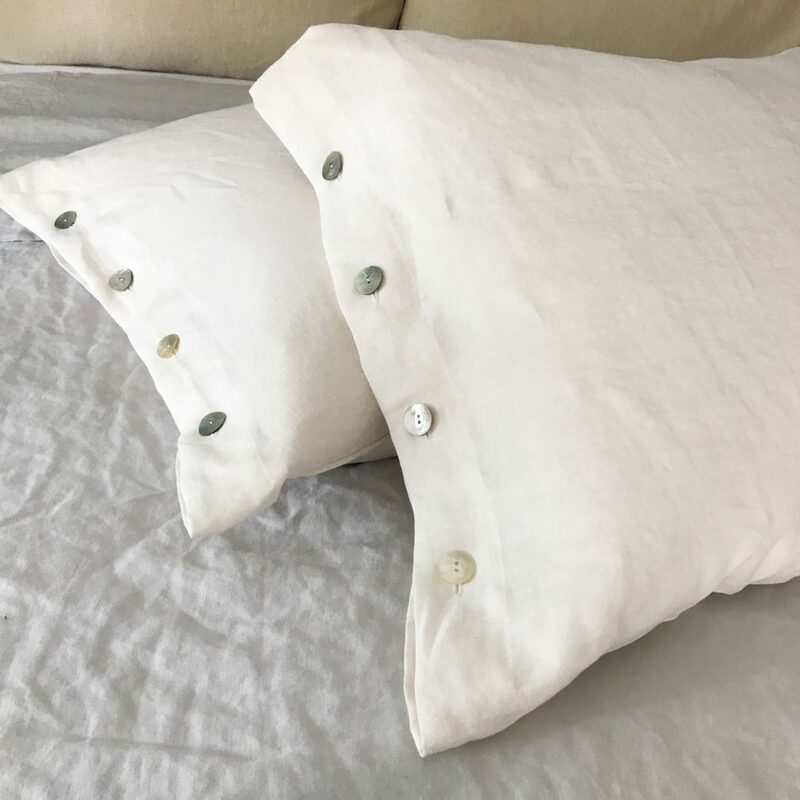 Some of these pillows I actually created on my own and you can see how I made a no sew pillow. 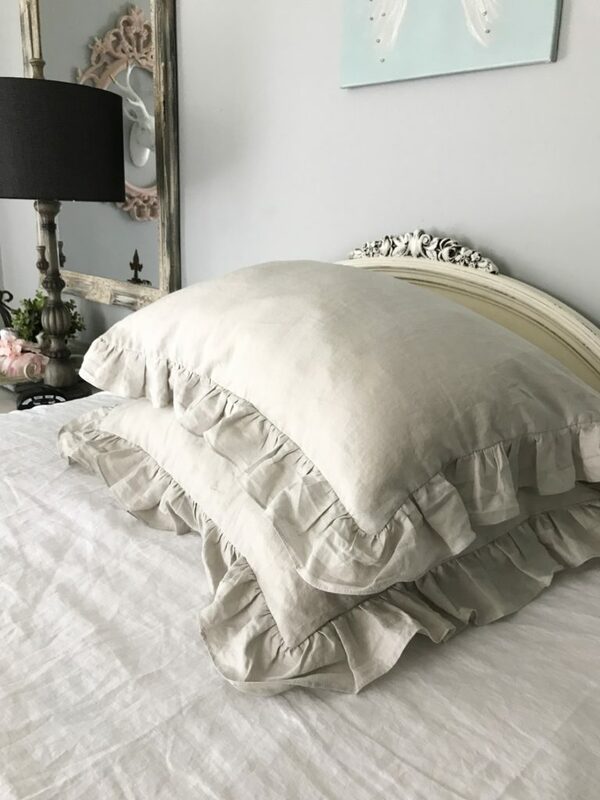 In my home we love the look of soft and neutral linens. They bring so much comfort to the home. 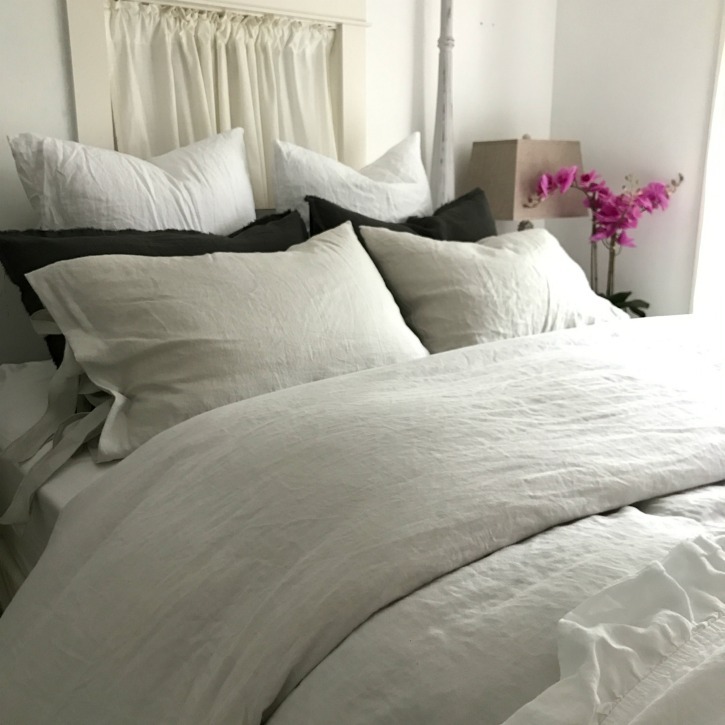 Bedding is a great way to bring neutral tones into your home. I now have a smaller selection of linens. It has been much easier for me to keep up with sewing and the basic colors are just so gorgeous. 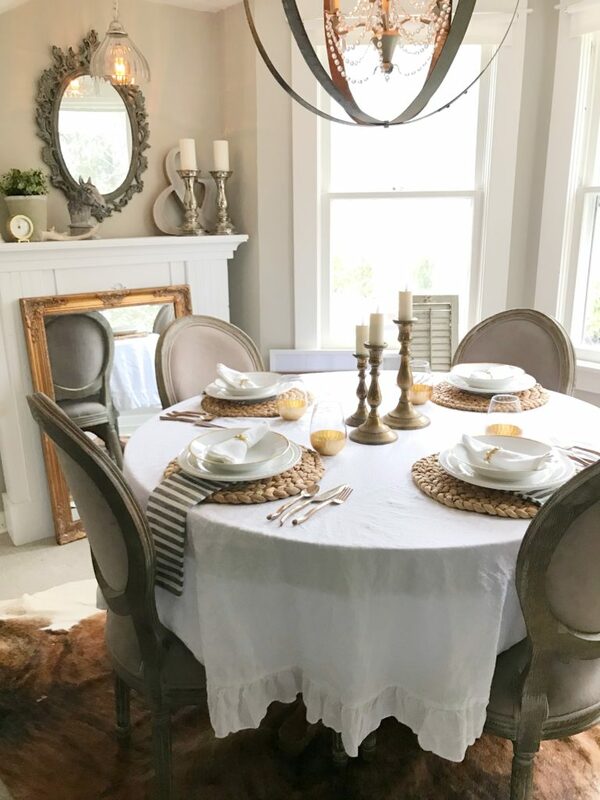 These soft linens look perfect in a breakfast nook, I have a charming farmhouse kitchen nook that would look wonderful if I added some custom linens. This napping porch was so fun to create. It’s so great on those sunny, warm Winter days! 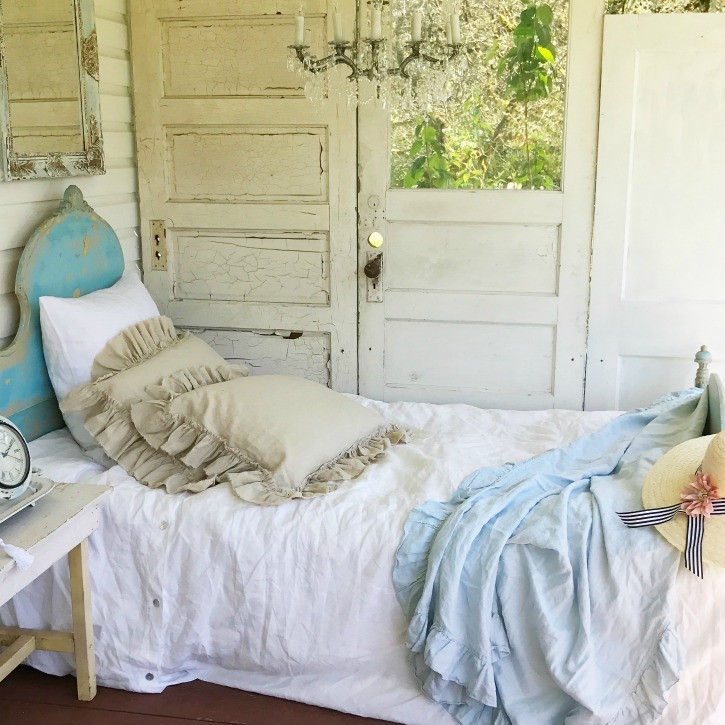 See all the details on my farmhouse sleeping porch. I often have a neutral palette happening in my home. But I also try to make it cozy and inviting. So I add different textures, like fur. 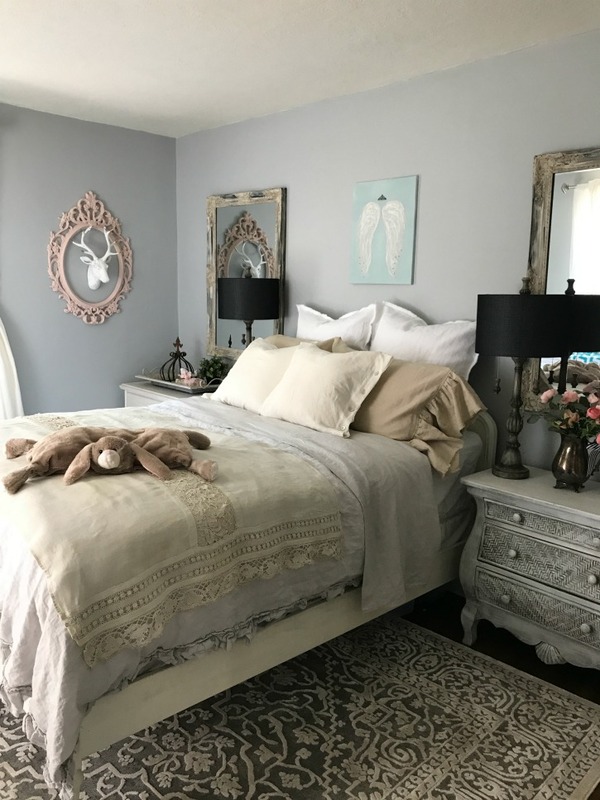 I am always changing room styles, but I have another neutral bedroom look I went for. 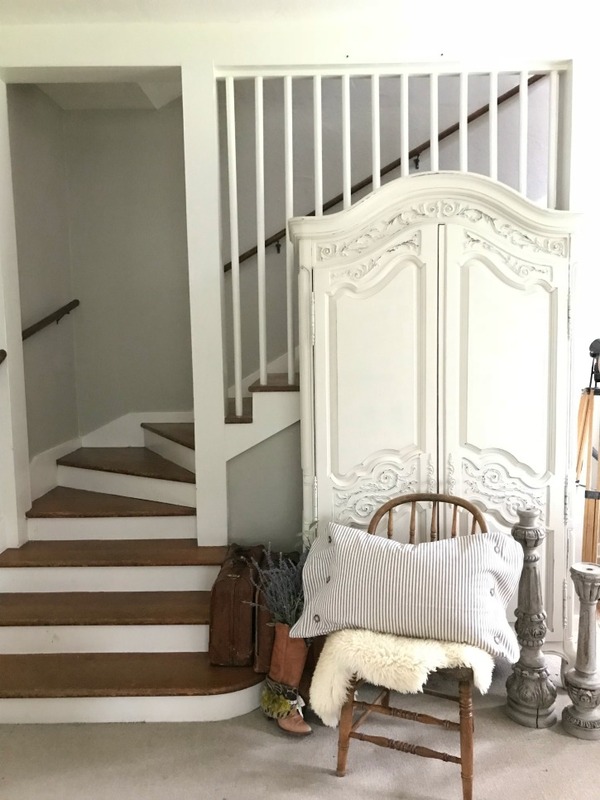 If you also want to check out more neutral decor I have a neutral shabby chic farmhouse tour. Love the neutral look in a bathroom! I simply add a neutral shower curtain, and there you go! I do like to change it up sometimes and add two shower curtains for a different look. 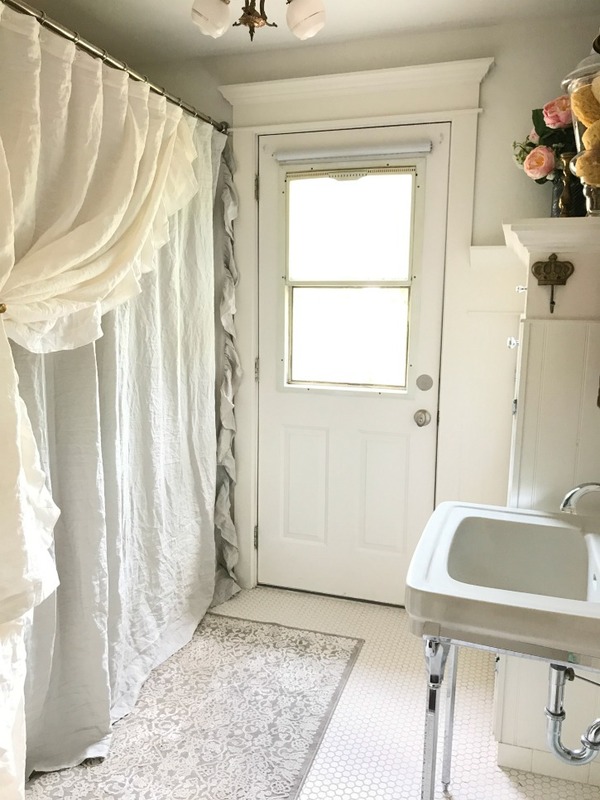 Come check out the neutral shower curtains in my shop. 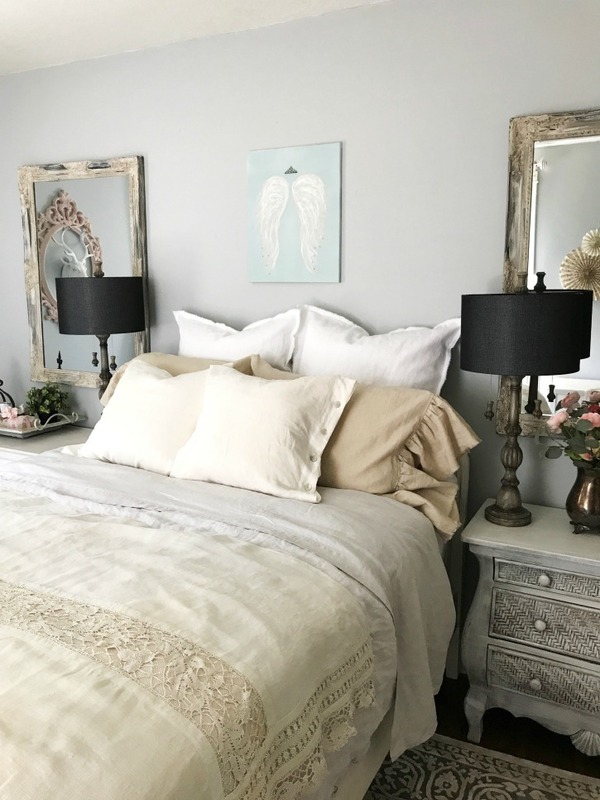 A neutral room can have a little sparkle! Like some metallic gold. I love the neutral look, it’s one of my favorites! 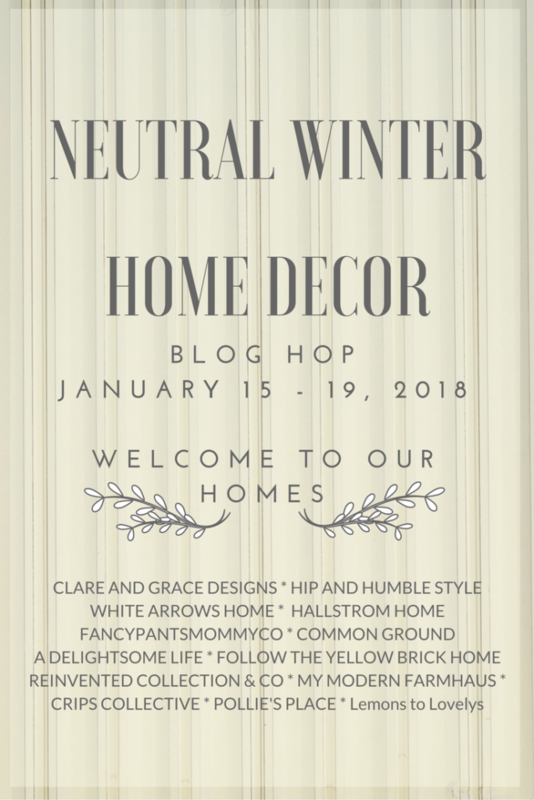 I am joining this wonderful neutral home blog hop hosted by A Delightsome Life. 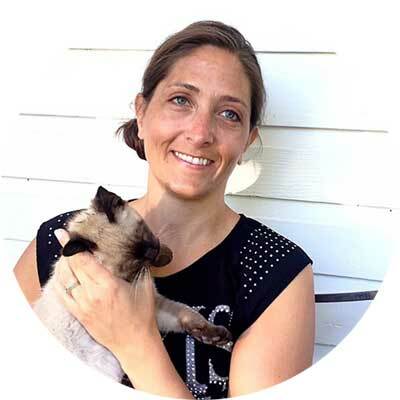 Next up is Pollie’s Place, be sure to check out her wonderful page! 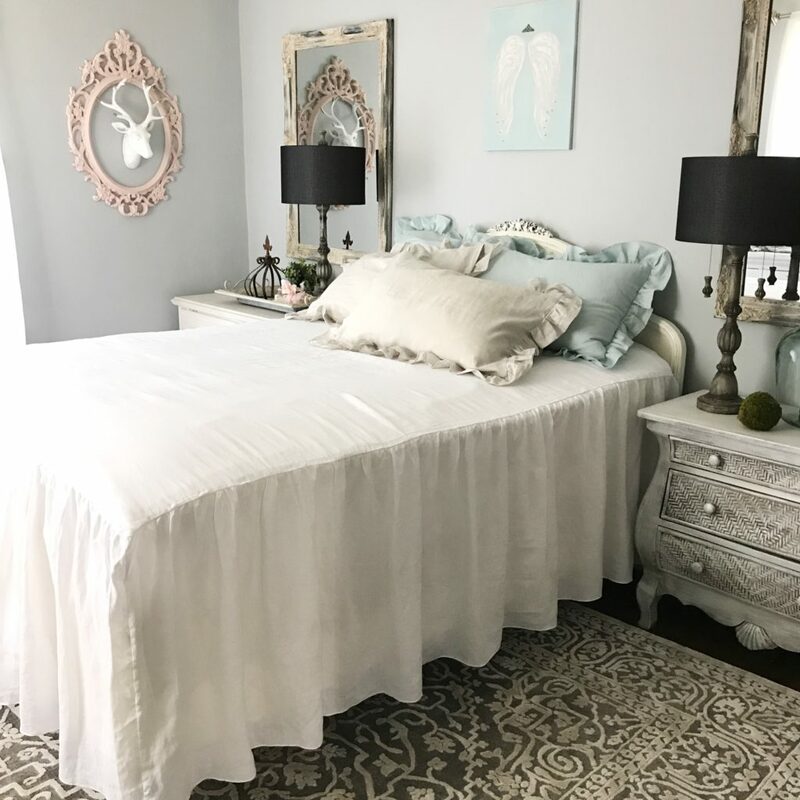 looooooove your linen bedding Rhonda!! You have made your home inviting and it gives everyone who enters that warm cozy feeling. I would like to come over and bask in the warmth with a hot cup of tea…YOU ROCK!! Your home is so beautiful, Rhonda! The blue and cream area rug in your living room is one that I have had on my list of rugs to choose from. I am so indecisive. It looks so beautiful in your home. I have a lot of black ticking stripe in our living room and not sure if I should bring in any blue to the space. Well did you hear that black will be one of the next trendy colors. Rhonda great job sis! Looks Devine dear girl!!! I love all your bedding and pillows! Your mirror and armoire in your living room are gorgeous and I’m always swooning over your napping porch!! I’m inspired by so much here Rhonda! Is something on the floor in the dining room? The secret is that I have a stash of frames and a shutter behind the table. I forgot they were there. I just love how cozy & warm your house looks. So many other “ neutral” homes look cold to me. Everything is beautiful. 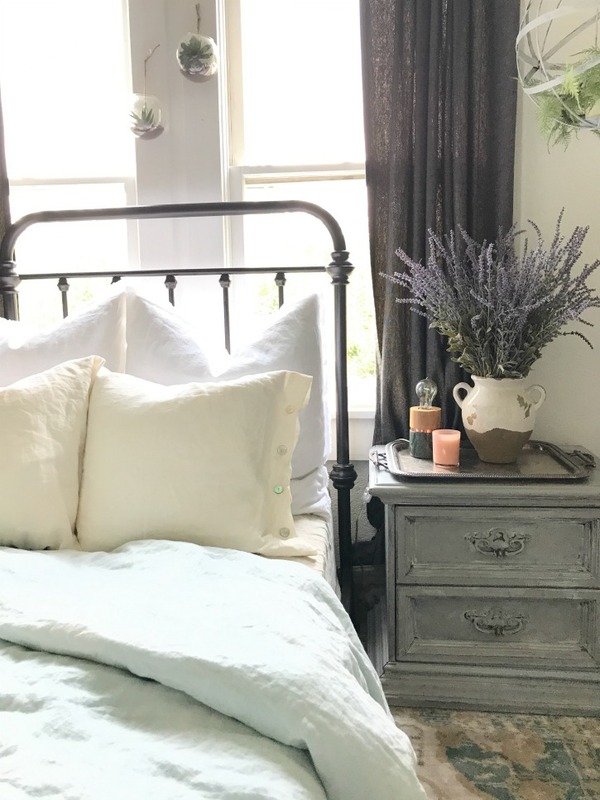 I love all the cozy layers and the bedding in every room is gorgeous. 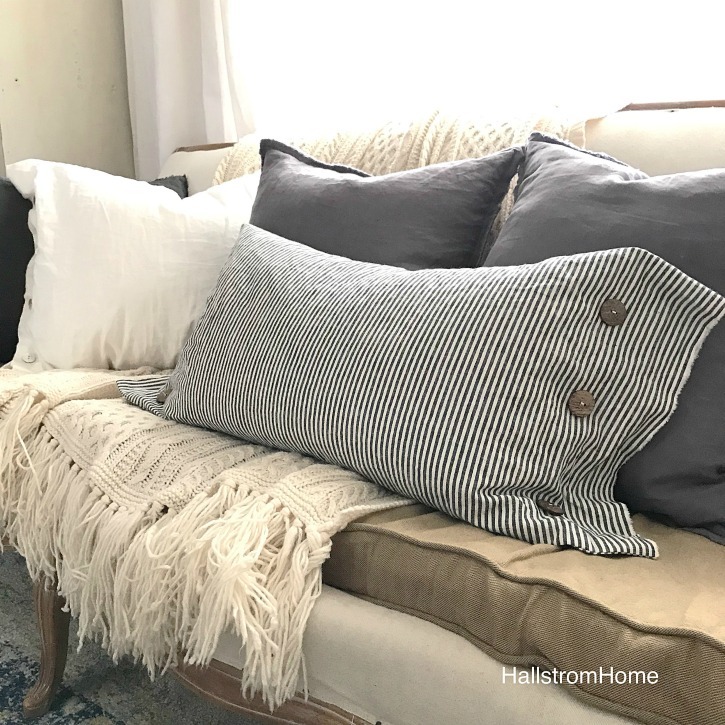 You’ve created a very comfy look in every room and I love your style! Thx Deborah!! It’s so fun to see all the different styles in the tour. Rhonda, your home is so warm and inviting! I love your style! There is so much inspiration in every photo! Well done girl! It’s all so cozy and yummy!! I love your mixture of texture and soft color! Love all the layers and textures! So beautiful and peaceful for winter!! Great job Rhonda! !